The Road to Self-care Isn’t Straight! In the book, Core Concepts of Mindful Eating: Professional Edition, I created a tool called The Mindful Eating Map. The Mindful Eating Map is a guide to help you bring compassionate self-care into your life. Here are the five steps. Stretch your ability to engage in non-judgmental observation of the current situation. Sensory experience including taste, sight, sound, feel, hunger, fullness, satiety, wellness, illness, pain, and discomfort, etc. Thought experience including thoughts past, present, and future. Emotional experience including the wide spectrum of feelings, not just the pleasant but all emotions including the mundane and the novel, which are part of the human experience. Try to categorize your observations Are they pleasant, neutral/unsure, or unpleasant? You may notice they are a mixed bag with some pleasant and some unpleasant all rolled up together! Identify your personal needs with self-compassion. Describe the steps available to reduce the harmful experience associated with your unmet needs. Dig even deeper, and add a level of self-compassion to your evaluation. What opportunities exist for you to meet your physical, emotional, and social in a way that does not cause harm to yourself or others? Set your self-compassionate intention to reduce the harmful/negative experience associated with your unmet needs. Follow your intention to reduce the negative experience associated with your unmet needs with self-compassion. Advocate for yourself and all living beings ethically. 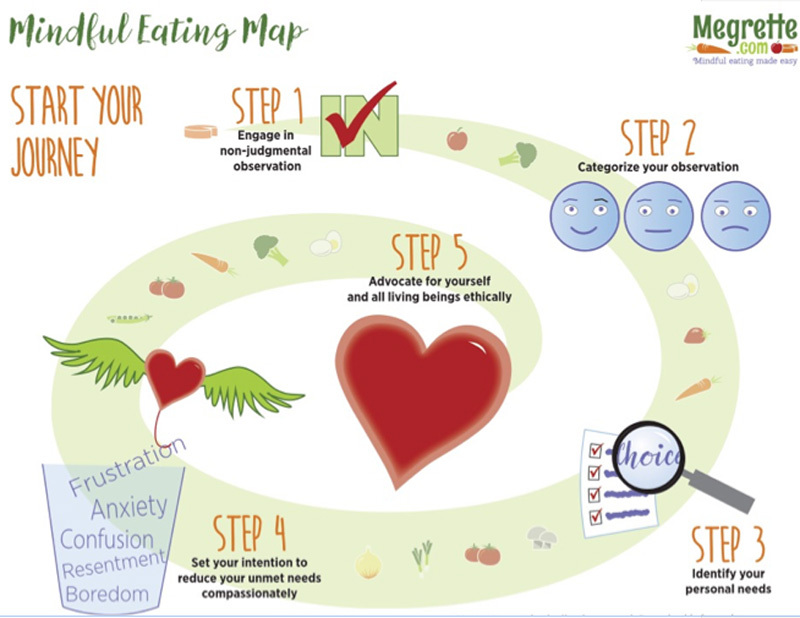 People love the Mindful Eating Map, but wonder, how do I use it when eating? Here is an activity to try. At your next meal or snack simply observe the food before you. Non-judgmentally examine your food, starting with color, shape, texture, and temperature. Engage your other senses, smell the food, feel the food, and really notice the food. Now, take a bite. While you chew, consider if the experience is pleasant, neutral, or unpleasant? Remain curious and non-judgmental about eating. Allow your experience to change as you take each bite. For example, the first three mouthfuls might be heavenly, but the fourth may be so-so. Or maybe the first bite is okay, but then on the second, the flavor seems to fill your mouth with joy! Ask (instead of telling yourself), overall, is this experience pleasant, neutral, mixed or unsure, or unpleasant? You can use this information to make a decision about eating. If it is pleasant or neutral, decide “Will I continue to enjoy this food if I keep eating?” If you would, then keep eating. If you wouldn’t enjoy the food more, consider your options? They include stopping eating or eating other foods. The key is to ask and allow yourself more than one choice. 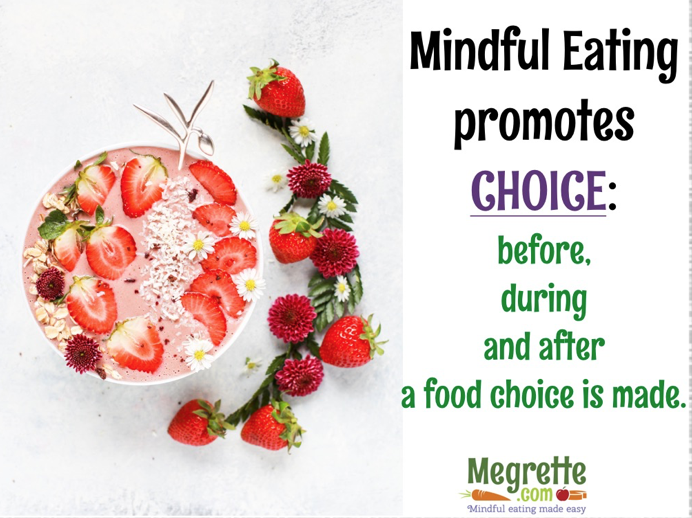 Now that you have made a choice (to keep eating, change what you are eating, or to stop eating) the next step comes, creating an intention to be compassionate with yourself.